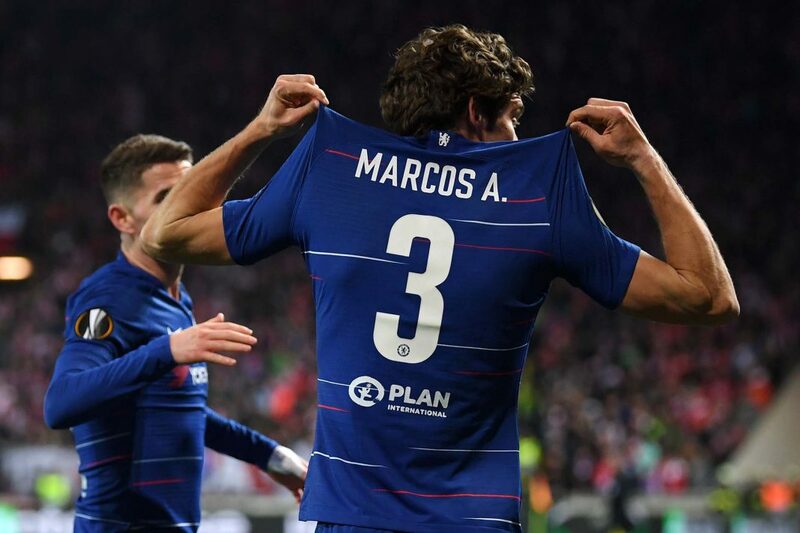 Marcos Alonso celebrates after scoring his team's first goal during the UEFA Europa League Quarter Final First Leg match between Slavia Prague and Chelsea at Eden Stadium on April 11, 2019 in Prague, Czech Republic. Chelsea came away with a win and an all-important away goal from the first leg of the Europa league quarter final in Prague, but were outplayed for large periods of the match by Slavia. The home side acquitted themselves extremely well, showing why they have reached the latter stages of the competition. Despite taking a lead and an away goal into the second leg at Stamford Bridge, it is not going to be easy. Slavia started much quicker than Chelsea and forced an early chance as former Chelsea player Miroslav Stoch whipped in a free kick from the left which was met at the far post by the diving header of Simon Deli which flew wide. The home side proceeded to play with a good tempo, which they matched off the ball. A high-energy press was not negotiated particularly well by Chelsea in the first half. The press combined with poor ball usage when playing out from the back and in midfield by Chelsea meant that we remained largely on the back foot in the first forty-five minutes. Slavia matched our three-man midfield, but played with two deeper midfielders and Petr Sevcik in front of them, behind forward Olayinka. Without an overload in any area of the pitch it was difficult to create openings as Slavia closed the right areas at the right time to stop us playing out. It was Sevcik who had the next effort on goal. A neat triangle down the left saw Sevcik receive the ball in behind Jorginho after a pass from Stoch, and the midfielder drove the ball from twenty plus yards out. He caught it well but it was straight at Arrizabalaga who held at the second attempt. Our best opportunities appeared to be on the break down the left flank. Willian getting in on the counter attack a couple of times as the right back was caught up field. Unfortunately on both occasions the play broke down in the final third before we could get a strike on goal. It wouldn’t be long before the Brazilian would be firing goal wards though. Christiansen drilled a lovely ball out wide to Azpilicueta, who looked to whip an early low ball into the box from the right before his marker got out to him. This didn’t quite reach Giroud, but Pedro picked up the scraps. He switched it out to the left corner of the penalty area where Willian received and cut inside. He bent a superb effort towards the far top corner. The keeper was beaten but it came crashing back of the bar. Chelsea had grown into the half, but even with increased possession were struggling to create. Slavia were extremely well organised from back to front, and we couldn’t get the better of them, particularly in the centre of the pitch. Our best chance still looked to be hitting them on the break. Kepa claimed a cross from the right and rolled out to Barkley in the centre of the pitch, who exploited the space with the Slavia midfield still making their way back from the Chelsea box. He slipped a ball through to Giroud, but he was flagged offside in a marginal call with the last man on the floor. 0-0 at the break, and Chelsea needed to step things up in the second half. Just shy of the hour mark and things hadn’t gotten any better for Chelsea. Eden Hazard was summoned from the bench to enliven proceedings. Soon afterwards Rudiger went close as Willian whipped in a corner from the left. A Slavia defender got a head on it at the near post, but this only knocked it as far as the six-yard line at the far post. Rudiger had peeled off in anticipation and volleyed it goal wards. The keeper made a smart stop with his foot stretching to his right. Slavia cleared to halfway, but Hazard spotted Willian between the lines, the Brazilian then played a one-two with Giroud to get in behind, but could only drive wide across goal from the left side of the box as the angle narrowed. Although Hazard was causing problems for the home side when he got on the ball, his introduction followed by that of Kante didn’t have the desired effect. Slavia were still in this as much as we were. It was their turn to create on the counter attack next as the match headed into the final twenty minutes. Traore ran at Christensen and Azpilicueta, powering a shot at goal from the edge of the area. Kepa dived full stretch to palm away. Great play all round. Chelsea had struggled in an attacking sense because of some well-executed defensive tactics by Slavia. They brought their back line up towards their midfield when we were looking to play into the final third, reducing the space between the lines where we had profited against West Ham, and where the likes of Hazard and Willian do their damage. This was coupled with closing our three midfielders down, and their own wingers effectively man marking our full backs when they overlapped. Henceforth it was difficult to find space in the middle or in front of their defence, which on occasion resembled a back five as Stoch on one side, and Masopust on the other would drop deep to cover Alonso and Azpilicueta respectively. Slavia threatened again with ten minutes remaining. Kepa flapped at a cross from the right flank, and left back Boril acrobatically attempted to volley in at the far post. Kepa recovered to make the save though. Five minutes from the end we got our away goal. Willian received the ball on the right and whipped a superb cross in from deep. Alonso had mirrored Willian’s run on the opposite flank, and just before the ball was played in he cut inside his marker and headed for the penalty spot. Willian picked him out perfectly and Alonso obliged with the headed finish. Over the course of the match it was harsh on Slavia, but this sort of performance is how you win trophies. On the back foot, digging deep and still coming up with the goods. Slavia had continued to press throughout the match without tiring, and also showed they are a force at the other end of the pitch, so the tie is most definitely not over. Chelsea will have to be professional at home, and use the ball better in order to take some of the pressure off by keeping possession. Pedro, (Hazard 59), Giroud, Willian.